AlignLife Chiropractic & Natural Health Centers help patients enjoy lives of optimal health. Skip the fryer and mix up one of your kid’s favorite breakfast cereals into a delicious crispy coating for this oven-crusted alternative to fried chicken. Preheat oven to 375°F and line baking sheet with parchment paper. Place each piece of chicken between two sheets of plastic wrap and pound to a half-inch thickness. In a small bowl, mix flour, thyme, caynenne pepper, salt and pepper. In a second dish, whisk eggs to combine. In a third dish, spread out crushed cornflakes. Dip chicken into seasoned flour, turning to coat, then dip in egg mixture. Remove chicken and allow excess egg to drip off. 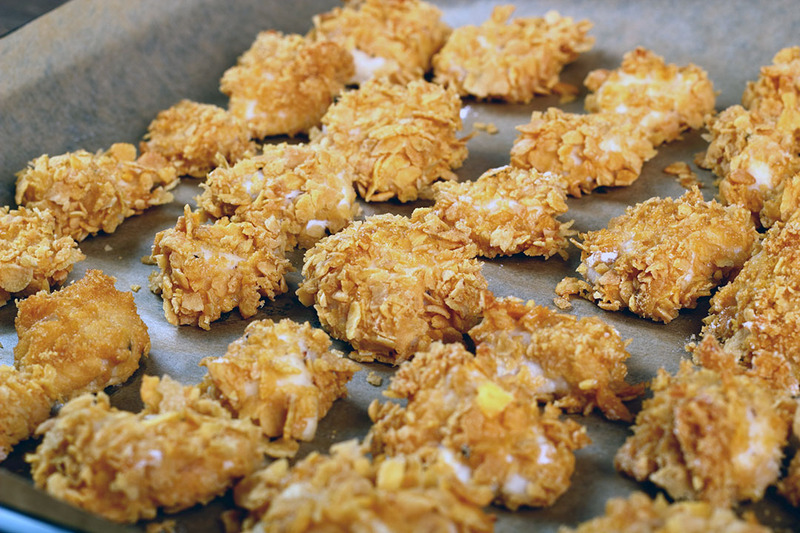 Press both sides of chicken into cornflakes, then transfer to baking sheet. Discard remaining flour, egg and cornflakes. Drizzle chicken with melted butter. Bake for 30 minutes or until coating is crisp and chicken is cooked through. Ready For More Health n Habits? Yes, Sign me up now! AlignLife of Summerville - South Carolina, Dr. Tom Mercante voted #1 Chiropractor 7 years in a row (Readers Choice). AlignLife of Simpsonville - South Carolina, Drs. Allie & Mike Hamstead A-List Award (Simpsonville Chamber of Commerce). AlignLife of Spartanburg East - South Carolina, Dr. Chris Bedenbaugh voted Best of Spartanburg 2018 (Herald-Journal). AlignLife of North Peoria - Illinois, Dr. Rob Kelch Top 3 Best of the Best 2018 (Peoria Journal Star). AlignLife of Wauwatosa - Wisconsin, Dr. Sara Mahalko-Leonardt nominated Best of Milwaukee (Shepherd Express). AlignLife of Cherrydale, Downtown Greenville, and Greenville East - South Carolina Top 3 Best of the Upstate 2018 (Greenville News). © Copyright 2019 AlignLife®. All Rights Reserved. Privacy | Terms All content posted on this site is commentary or opinion and is protected under Free Speech. The information on this site is provided for educational purposes only. The information on this site is not intended as a substitute for a relationship with a qualified health care professional and it should in no way be misinterpreted as medical advice. AlignLife strongly suggests that you seek advice from a competent health care professional. AlignLife assumes no responsibility for the use or misuse of this material. Your use of this website indicates your agreement to these terms and those published here . All trademarks, registered trademarks and servicemarks mentioned on this site are the property of their respective owners. Individual articles are based on the opinions of the respective authors.